NTV's official Sengoku Basara: Judge End website updated this afternoon with new cast information, character designs and the long-awaited promotional video! Unfortunately the video is blocked in my country so I can't embed it here. Alternative links for foreigners in the same position are already up at Dailymotion and Nico Nico Douga. The opening theme song will be Thunderclap by the group Fear, and Loathing in Las Vegas. Unless Ishikawa Chiaki's ending theme is very different to her usual style, I'm guessing that it's the opening which plays in the promotional video. I'm not entirely sure I like the song (yet) but the video is fantastic overall! In addition, Hideyoshi, Hanbee, Yoshitsugu and Tadakatsu also now have character profiles on the official site. 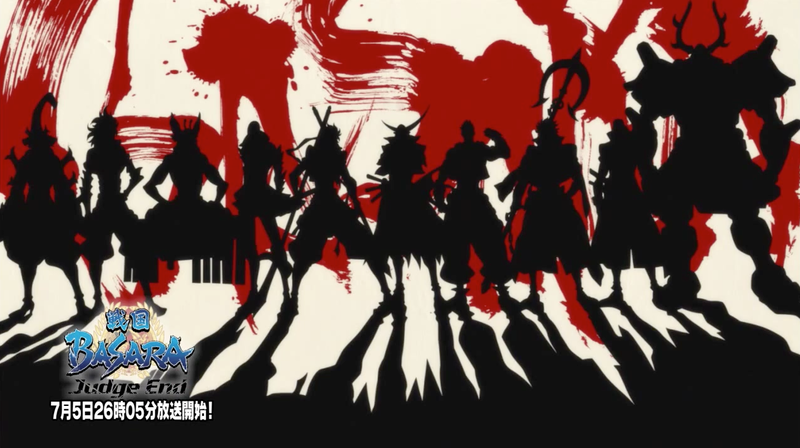 The list says there will be other characters not yet announced; the PV reveals several of them though since Oichi, Oda Nobunaga, Tenkai, Kobayakawa Hideaki, Fuuma Kotarou, Chousokabe Motochika and Mouri Motonari are clearly visible. The last two even appear in the silhouette lineup at the end, implying they will have major roles. Sakai Tadatsugu is a new historical figure joining the series for Judge End and his profile describes him as a Tokugawa clan warrior, a retainer to the Tokugawa family and advisor to Ieyasu. He's served the Tokugawa clan since he was a child and, being an old friend to Ieyasu, he's one of the very few people who can address him simply as 'Ieyasu' instead of using an honorific title. Sakai has an unusual kind of rivalry with Tadakatsu and harbours an unspoken dissatisfaction at Tadakatsu being valued more than he is. His motto is "Believe!". The most interesting aspect of Sakai's character though is the fact that he's being voiced by T.M.Revolution's Nishikawa Takanori. Fans are already noticing similarities between Sakai's design and the outfit Nishikawa wore for HOT LIMIT some time ago, something that Nishikawa himself seems amused by. Seiyuu Hoshi Souichirou (Sanada Yukimura) and Seki Tomokazu (Ishida Mitsunari) will be getting together starting on Sunday 13th July 2014 to present a 30-minute Sengoku Basara: Judge End web radio show. It will be broadcast on Bunkahousou's Chou! A&G+ service from 24:30 to 25:00 every Sunday (that's 00:30-01:00 on Monday morning, in normal time notation). Gift have now announced details for online sales of their two Mame Sengoku Basara: Chara x Cushion designs. They're actually cushion covers so you have to insert your own cushion inside, but customers who buy two items will receive a free cushion to get them started. 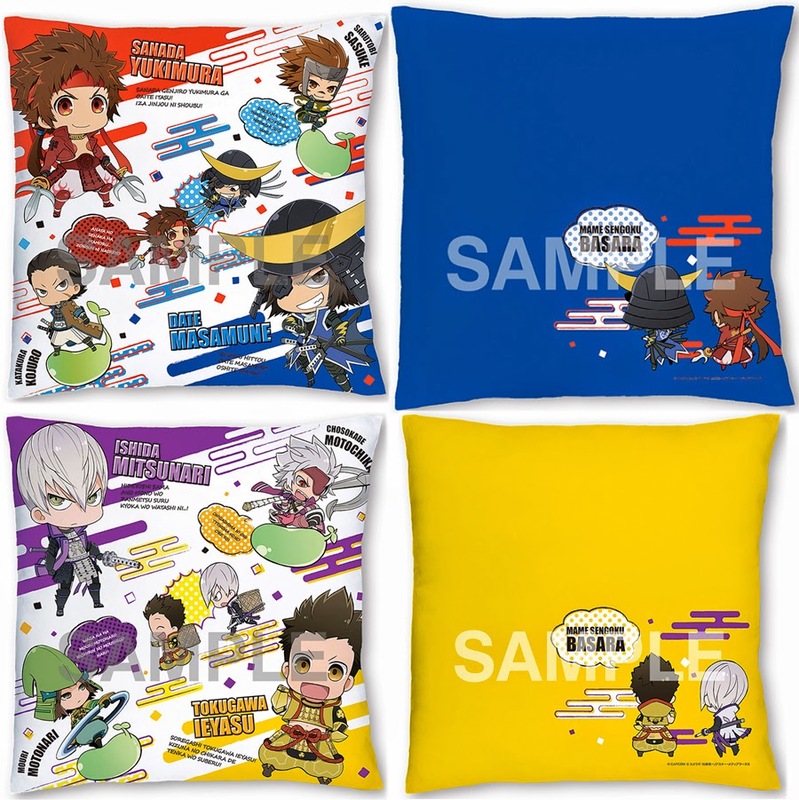 There will be a blue cushion featuring Masamune and Yukimura (direct shop link) and a yellow design with Mitsunari and Ieyasu (direct shop link). Both cushions cost ¥2,700 with tax. If you plan to buy one I'd recommend asking your proxy service in advance because they will only be available for reservation from the Gift Online Shop for a very limited time between 18:00 on 4th July and 13:00 on 14th July 2014. They are due to ship in the latter half of September. Gift also posted details of their collectible Mame Sengoku Basara Cleaner Straps which I don't believe I ever mentioned before. Nine designs are available for ¥300 apiece and each of them comes with an earphone plug. The straps have been given a limited release in Animate's main Ikebukuro store from 7th June 2014. It's possible that a wider release will follow later on. Manga Oh has revealed that the next issue of Sengoku Basara Magazine is due for release on 27th August 2014. Expect preorder listings to begin appearing at other stores very soon! 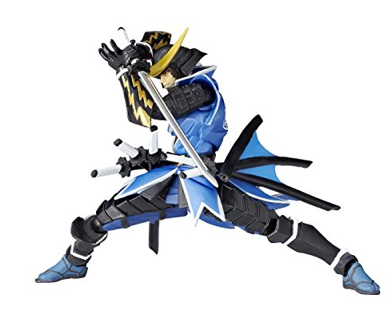 A new Date Masamune figure is set to join Kaiyodo's Revolmini line on 25th September 2014. It will have catalogue number RM-004 and it's priced at ¥3,564. It looks very similar to the full-size Revoltech released in the past; I wonder whether more characters will appear as the new Revolmini line continues to expand? The figure can be preordered at Amazon Japan; more stores are expected to list it soon. We finally have the details for Empty's new 10.5cm Ishida Mitsunari Chara-Forme figure. Mitsunari can currently be preordered at Ami Ami, e-Capcom and Amazon Japan and he's set for release on 25th November 2014 for ¥3,150. It's good timing since e-Capcom is currently celebrating a Toyotomi Matsuri this week. 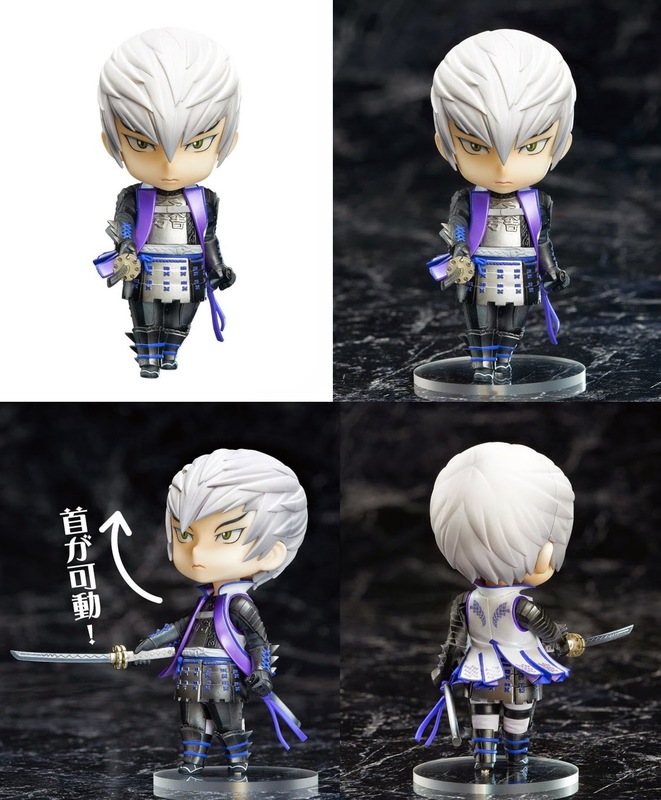 Special bundles of goods are available aimed at fans of Mitsunari and the other members of the Toyotomi forces. I wonder how much longer we'll have to wait to see the planned Ieyasu model? Last but not least, the 2014 Sengoku Basara Sousenkyo on Twitter popularity ranking recently closed in Japan with 2,963 participants. The ranking is completely unofficial and the results this year have been a little crazy - see for yourselves. Please note that there's a natural bias in this being a Twitter survey as not everyone who enjoys the series uses Twitter or follows the same groups of people. After watching the video enough the opening song finally grew on me, and I was really hyped to see Tsuruhime and the other people from 3! There are some weaker shots but overall I think the PV looks much better than I had dared hope. Whee! I'm a bit worried about Yukimura, though. (It's always back to this with me, sorry x_x) Does he even appear after the first few seconds? He's not shown when the Masamune, Ieyasu and Mitsunari are interacting... I'm worried that he'll have his own angsty storyline separate from the main conflict, and that in the end he'll be sidelined again. 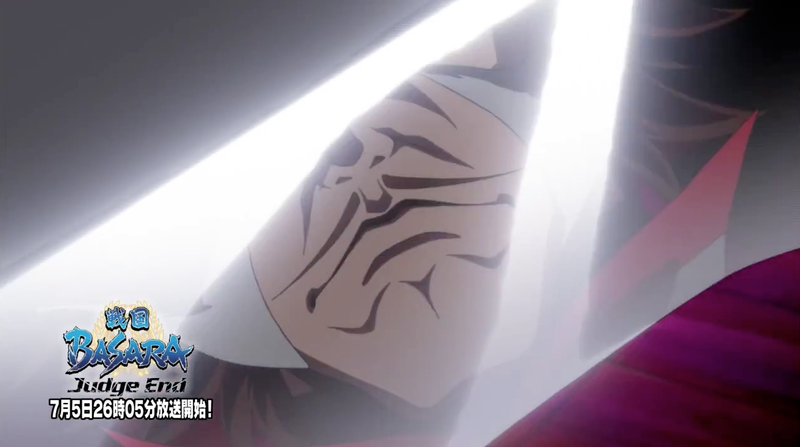 :/ I hope I'm wrong, but the preview is not really promising from a Yukimura angle. He's definitely in the psychedelic 'four main character' splash screens at the end, and right in the centre of the last silhouette shot (with the Sekigahara duo displacing Kojuurou and Sasuke) so I think he will be ok. I have a good feeling about Yukimura's prominence in JE but I understand your concerns, especially with the inconsistent treatment he's had lately. 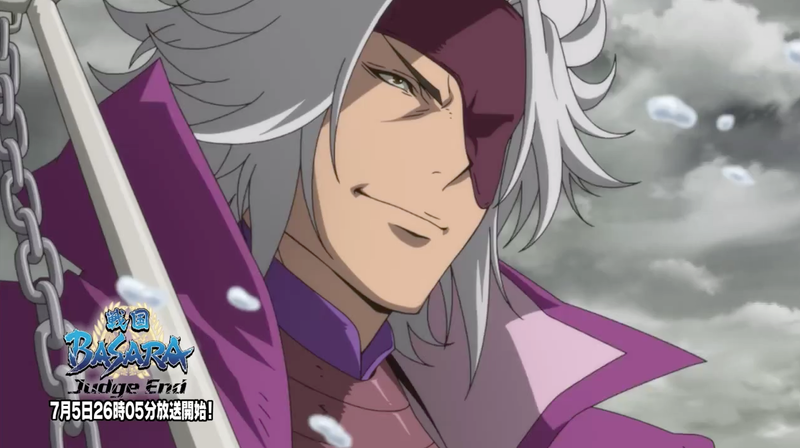 At least the Yukimura fans have been rising back up to support him - I think almost every comment I see about the new anime is a fresh opinion about his new hair (lol). I was especially happy to see how cheerful Kasuga looked after seeing her upset and serious in 4. She's so cute! Although the animation seems iffy, I like how they draw characters, they look identical/better than in P.I.G. 's version (notable exceptions: Hideyoshi, who looks pretty okay in the PV and completely hilarious on the anime's website and Kenshin with his puny head - though this may just be QUALITY). Also, I like how they maintain drawing Tadakatsu more human-like (which I think is closer to his Tsuchi artwork). Poor Motochika looks like he got older by at least 20 years though. The PV seems to have shown absolutely everyone sans Ujimasa. Poor guy can't catch a break, can he? 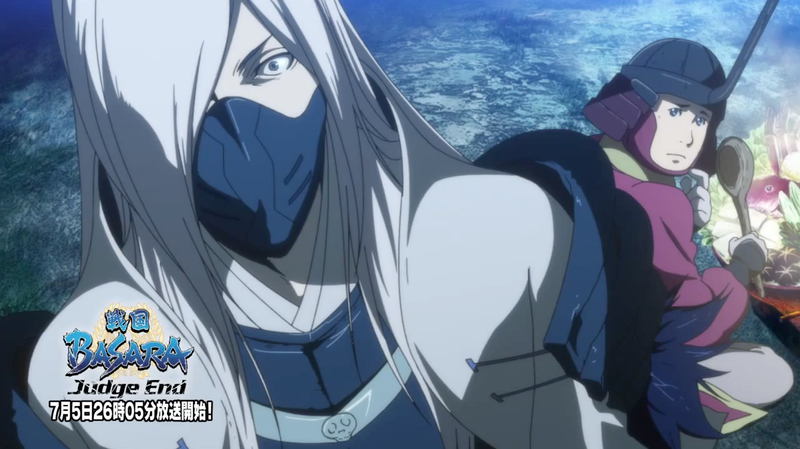 Unless that static snippet before Ichi is him- Who am I kidding, it's most likely Nagamasa. The new guy's design is REALLY meh. I hope he'll get the Sakon syndrome and make up with his personality. I also wonder what's the point of focusing on H&H and Shingen - characters that didn't really have a lot of spotlight in SB3. A surprise, maybe...? Too bad TMR didn't get to sing the OP, but those new guys at least keep a similar style. So this airs soon? When is it- HOLY WAKAMOLY it's a week and a half. And on a time I can accept with my non-GMT+9 time zone? Using a Masamune quote: Excellent! Sound good! I just hope they don't kill Ujimasa off early on again this time; he can contribute some much-needed comedy and bond with Kanbee later on. I'm guessing that they are pushing the Toyotomi army leaders and Shingen now because they won't appear much after the first episode or two, so we should get another batch with Ujimasa and the PV-only characters in the next week or two. Probably next week since it's going to be hard to show the battle at Odawara in the anime without them showing up. At this point I have a bad feeling about how long Sakai will survive; being both an anime-original character and a T.M.Revolution cameo he might end up falling in battle quite early on to make room for the others. Wow i've wanted for so long to comment here to thank you for all the info you provide for SB ! Fnallly a trailer, can't wait to see how it will be this new season. By the way, do you think this could be used to catch attention on the brand and maybe if dubbed, hel for the localization of SB4 ? Also i hope for new merchandising related to JE. We should all try to get as many new fans watching the streams for Judge End as possible to show the companies that there is an audience out here waiting for more of the series. TRAILER! I'm happy!!! Look at all those characters they have managed to squeeze into the anime. Even an original one. I don't know what this means for the plot's quality but I was super happy seeing every single one of them anyway. 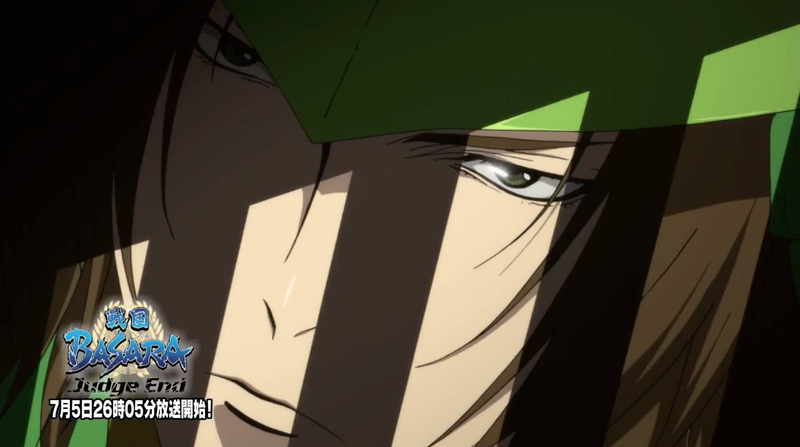 Yay cool Magoichi! Tsuru! Tenkai & Kingo! Wait what, Nobunaga is alive too? "Maybe he will sing in the show making all the soldiers dance"
That would be pretty amazing.What if his role is to pump up Ieyasu's army by performing the Hot Limit dance. "What if his role is to pump up Ieyasu's army by performing the Hot Limit dance." I approve of these ideas! 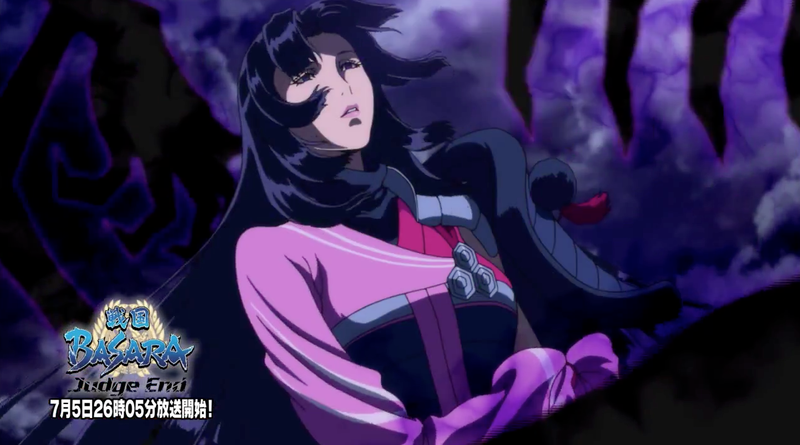 Also, I'm pretty sure the hand before Oichi is Mitsunari's. It looks like his armoured hand, and the background matches that ravaged area he was in at the beginning of SB3's opening. It's clearly Nagamasa's hand: white gauntlet with only the back part of the hand being covered by a red armor piece. 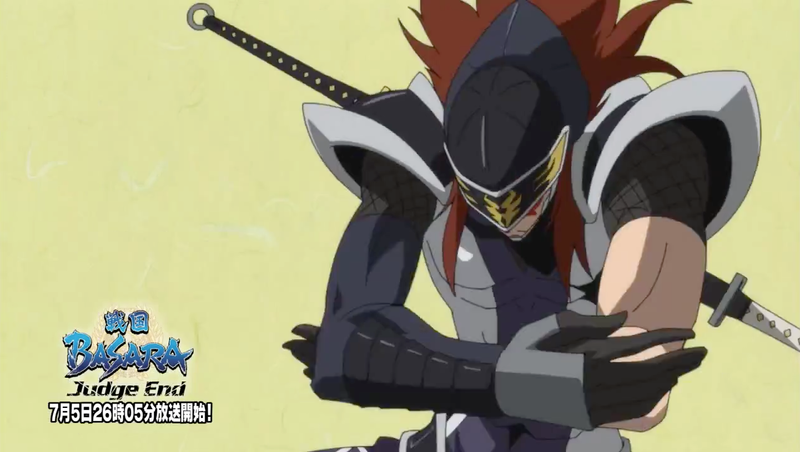 Mitsunari's armor is darker and cover all of the hand, i can post a pic of it from the trailer if you want. Looking at the trailer I'm 100% certain that's Nobunaga's gauntlet with his cape in the background. Oh yeah, the angular fingers do resemble his gauntlet rather than a hand! Huh, I thought I already posted here, guess not. Hot damn, yes, I knew I shouldn't have been worried about Kasuga and Kenshin! :D! My babies~<3 Rather shocked about Nobunaga and Oichi being involved again though, but hey, I love Oichi. So that's cool. Mago and Tsuru look great too! Kanbei kinda flashes by super quickly but he looks okay. I'm inclined to agree that I'm not sure how long Sakai will last. If they wanted to go with a character that would last a while, certainly they wouldn't choose someone who dies four years BEFORE Sekigahara. With any luck MAYBE Naotora will show up in his place, but I kinda find myself doubting that an awful lot, especially with Sakon nowhere in sight. But that's fine, it's about time Basara 3 got its own adaptation that wasn't the (sad to say, because IMO it was) lackluster movie. Perhaps his death will serve as an inspiration for Ieyasu to kill Hideyoshi or something? By the way, am I the only one who really liked the movie? I thought it was great fun, then again, I didn't expect it to be more than that. Oh of course! It's just that there are several other Tokugawa retainers that live past Sekigahara, including a few who could indeed take up the role of "Ieyasu's childhood friend", so I find it interesting that they chose Sakai, who is the only one of Tokugawa's "Four Heavenly Kings" to not make it to 1600. I enjoyed the movie for what it was, but it really felt like it was hyped up to be so much more? I think I might just be biased against it as I was hoping for certain stuff (cough Magoichi cough Sorin and Muneshige antics cough) that I should have known would have no way to be mushed into a 1 hour 30 minute movie that already had its work cut out for it setting up a Mitsunari-Masamune rivalry that didn't exist in the games. Not to mention Kenshin actually losing at Kawanakajima and Kasuga being reduced to a nonspeaking cameo role... Ah well, listen to me saying I liked it when I have all these gripes about it. I really did like it though! "By the way, am I the only one who really liked the movie?" I thought The Last Hotpot Party was a bit of a mess really, but there was scenes I enjoyed (like the duel involving horses) nice to see the SB3 characters, good music etc. So not my #1 favourite thing ever but defintely entertaining. It's going to be interesting to compare how this TV series will do things compared to that movie. We already now that the plot will be completely different. And from what has been shown of the characters I kinda like this style for them better despite some wonkiness. I enjoyed the movie a lot despite its various disappointing aspects (I think I watched it three times in a row when the disc first arrived >_>;;;). It was a shame that Sengoku Basara 3 was being talked about so much back then but so few of the new characters actually got to appear at all.